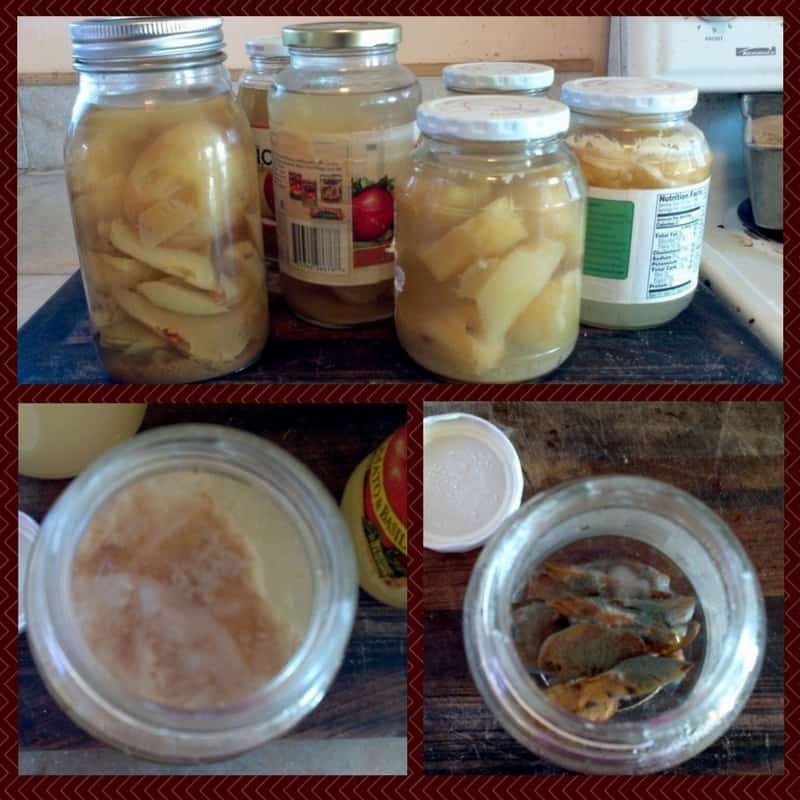 I was so excited when I learned I could make my own homemade apple cider vinegar from bits of apple waste we produce every day in the kitchen. While my apple cores and peels never get thrown away (the chickens eat them out of the compost bin), this gives me one more use for them. I love multi-purpose stuff! I have to admit I was a little hesitant because keeping things in the cupboards instead of the fridge was new at the time I started making vinegar. However, after living without a fridge for over 6 months I know what to look for when food spoils. The smaller you chop your apple leavings the quicker your vinegar will be done and the stronger it will be but I’m usually doing about a million things at once and chopping apple cores just isn’t on my list of important things to do so I just chuck them in the jars as I make snacks for the kids. Add a bit of raw unfiltered apple cider vinegar (ACV) as a starter. Or add a piece of the “mother” the white gloppy thing that you see in raw vinegar. (I’ll show a picture later). I like to put in a few tablespoons of ACV per cup of water. The more you put in the faster it will ferment. Cover the apples with water and either cover with a cloth, or make sure you open the lid every few days or so to let any gasses escape. Let sit for at least 6 weeks. (Longer won’t hurt). Strain out apple pieces for the compost or chickens. There you go! Super easy, takes about two seconds to begin and you can produce yet another food at home in your kitchen AND use something that is otherwise considered waste. And as promised, the above picture includes a picture of the mother. The mother is on the bottom left. You can leave the mother in the jar or pull it out to jump start your next batch. Just in case you’re worried about knowing if your vinegar is spoiled I’ve included the picture on the bottom right. Believe me, you’ll know! I started my first batch of fruit vinegar by purchasing a bottle of Bragg’s raw unfiltered apple cider vinegar from a local grocery store. If you don’t have a friend with an extra “mother” or vinegar to share and buying isn’t an option you can start your vinegar with a sugar water solution instead. Use one tablespoon of sugar per four cups of water. Once you get it going definitely add the mother into your batches! Want some ideas on how to use your ACV or want to see how to do it in video? Check out Blake Kirby’s videos Apple Cider Vinegar Made In Your Own Kitchen and Apple Cider Vinegar (ACV) Made From Scratch. Do you preserve the mother between batches or do you just continue to use it? I have some that’s finished and am wondering whether I should keep it somehow or just start another batch! You can just let it sit in the bottom of the jar and it won’t hurt anything, but if you are starting another batch toss it in and it will give it a jump start. I have been enjoying making kombucha – now I am excited to make my own ACV when apples are on sale (in MN) this fall! Thanks for the post! Also, I am enjoying the changes to your site – it looks great! Ooh, I haven’t tried kombucha yet, that’s on my list of things to try! Thanks! I still need to tweak a few things here and there but I’m glad your enjoy the new look! It looks so easy! We have wanted to try making our own vinegar. It seems like a great way to reduce waste. How much is “a bit” of raw ACV? Proportions? Hi Heidi, the raw vinegar is just to start the fermenting process more quickly so you could use none at all and it would still work but it would have a longer fermenting time. I usually toss in a few tablespoons of ACV per cup of water. Can apples that have started to soften & go “bad” be used? I use soft or mushy apples and they turn out well. I cut any bruises off, so I’m not sure how those would turn out if you included those. does the jar need to have the lid loosened to release any gases from fermentation? Good point Tanya, I need to update the post! I keep my lids on tightly to keep out fruit flies, but I do crack them open them every few days to release any gases. Hi there. I am from New Zealand and not sure what ACV is? Yes, ACV stands for apple cider vinegar, I’ll update that as it is unclear in the directions! If I already have a large mother from ACV someone gave me, can I start another batch with just the mother? Can this be used like white vinegar, for batch canning? If you are just using vinegar in the water to reduce hard water stains, yes you can use it instead of white. I have a large crock of ACV and it has beautiful mother forming! We have 2 apple trees in the yard. So excited to try this and be successful! So when the ACV is ready, do I need to preserve it in any way? Do I can it like apples or just put it in jars and put the lids on? Oooh, so exiting! You can preserve it by canning or in the fridge if you want, but I personally just store it in the cupboard. My oldest jar is about a year old. 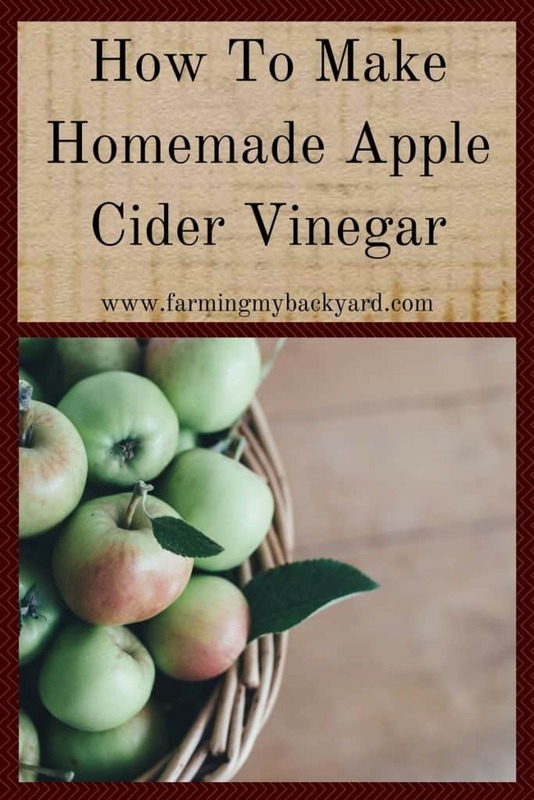 Yes, it can be used for anything you would use store purchased Apple cider vinegar for, but if you want to use it for canning you should check the acidity for each batch first because it won’t be consistent. Does this have the same health benefits as the raw vinegar we buy in the store? Does it matter if the jar is glass or plastic? Yes, it has the same live cultures. I personally try to avoid storing food in plastic, but I don’t think it would have any negative effect on the vinegar. Hi there I use acv in my horses grain therefore I leave it out in the barn. I go through a gallon about every 2 weeks. Would it be okay to store without refrigeration? I guess u ferment it without it. Would it be ok to leave it fermenting and just strain as I use it? Or is it better to strain it at the end of 6 weeks and keep it in the barn? Are you starting out with raw apple cider vinegar or pasteurized? If it is pasteurized it won’t have any of the mother in it. If it is raw there will be a slippery mass inside the bottle. That is the mother of vinegar. It’s a collection of proteins and good bacteria that turns cider, apple juice, fruit scraps and water, or wine into vinegar. Brilliant! I’m so trying this. If you highlight the text you want to print, the left click and hit copy you can paste that selection into a text or word document and print from there. Some of the more formal recipes such as the Potato Chowder Recipe have an option to print that won’t include comments. When making my vinegar I was wondering if after I harvest my batch of Apple Cider Vinegar can I add more water to the used scraps and get another batch in 6 weeks it ate the scrapes spent and I have to start over with fresh pealings? I’ve never tried for two batches, but I would guess that it would make a very weak vinegar. I always feed the scraps to my chickens then start over with fresh peelings. Add the mother and water to more apples. You won’t need the sugar, as the mother will use the sugar in the apples. I was happy to find you on utube. I did make my first batch of ACV. I had forgotten to add sugar but did a little later. I have strained the apple out after about a month. It does smell of strong like vinegar but I did not get a mother like I saw in the video. After straining it is a much darker color than yours, I am leaving it covered on my counter top thinking maybe the mother will develop. I did use ACV to start it with. I guess I am trying to say sense I did not see the mother like yours should I worry. Sounds like to worked just fine even though it didn’t develop a mother. Add some of the vinegar you made to your next batch instead of the sugar to help jump start it! Excellent idea. Right now I have apple cider vinegar and 37 apples, the cores of which I’ve been throwing away recently. I am going to do this, and it’ll save me trouble disposing of the cores (even though the compost pile is like a 45-second walk, I hate the cold that much). I hate the cold too!